Have you tried Bar Keepers Friend? Have you ever seen a piece of silver or brass and thought, I like it but it is in bad shape. Well, all of the pieces that you see below were those kind of pieces(one is missing from this picture) - some more than others. I got all of them for $2 so I said, what the heck! I brought the pieces home and grabbed the Bar Keepers Friend. What a cute little stool this turned out to be. However, when I first saw this stool, I didn't give it much thought. My in-laws neighborhood was having a flea market at their club house. I picked up a couple of things and looked at this stool and said, "I don't know". Near the end of the sale, everything was half price. I kept walking pass this stool and finally said, why not. It was 50 cents. I also got a rocker for $1.00, you will see that in a later post. Amazing what you see on your way to the post office. I didn't have my camera with me, so I had to use my phone. This Queen Palm Tree Flower was right in the post office parking lot. 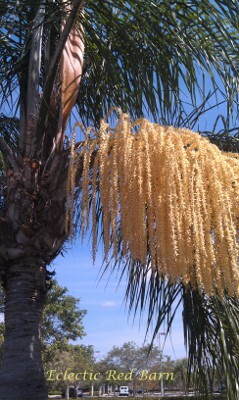 This flowering tree caught my eye because I had not seen this particular flowering palm before. Sometime you just want to sit and have some quite time. What better way to do that than to fix a cup of tea, (my favorite is Earl Grey), something sweet and sunshine. After I had made these lemon blossom cakes for my husband to take to work, I decided to sit and enjoy one of them. I wanted to make sure they were good, right? When we think of Easter, we think of lovely bright colors or pastel colors like pink, blue, yellow, and lavender. Some of my decorating does include those colors. However, for my table scape, I decided to go in another direction - browns and whites. I found these candle holders at a close out sale a couple of years ago, and to be honest, I forgot I had them. The Livingstone Daisy - MeZoo Trailing Red, now that is a mouth full, is a sprawling to mounding daisy plant with succulent green leaves edged with white, occasionally accented with button-sized red flowers in spring. I have been working on my Easter decorating and found my bunny pillows. Well one of them does not have a bunny on it, but it is pink. Does that count? This year I decided to put the pillows on my bench. I am thinking of redoing that bench, but that is for another time. Old window makes a great display! My husband said, "this window is falling apart". He was kind of right. The one side was not so bad, but it was the other side that caught my eye. When I picked it up however, the paint and part of the window was coming off in my hands. For $1.00 I had to have it. I love old windows. I didn't want to clean it up because I thought it might fall apart. Instead, I just use it as is. Pansies love spring weather. It seems other than the typical Easter flowers, pansies are the first plants to become available in early spring. They thrive in the cooler temperatures and I love having them in my garden. The pansy is a group of large-flowered hybrid plants cultivated as garden flowers. Pansies are derived from viola species Viola tricolor hybridized with other viola species. The common words "pansy" and "violet" are often used interchangeably. I have been watching as many bloggers have been posting lovely Spring and Easter projects. I am definitely behind in my decorating until this past weekend when I found these beautiful tulips that were calling to me. I had to bring them home. So I decided to start getting my Easter items out and begin decorating.